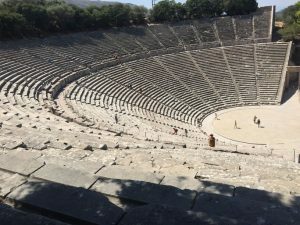 I recently returned from Patras, Greece where I represented the ISE at the third annual conference of TRISE, the Transnational Institute for Social Ecology. The conference drew participants from 13 countries and four continents for four days of discussions around the theme “The Power to Destroy the Power to Create; the Legacy of Murray Bookchin.” The forty-odd people who gathered ranged from veteran social ecologists to those newly introduced to the ideas, and a weekend of fascinating discussion grew out of this mix. The 2000 year-old amphitheater at Epidavros, known as the Sanctuary of Asclepius, seats up to 40,000 people and is still in use. Photo by Betsy Chodorkoff. The background of the conference, and a major theme that emerged in both formal sessions and informal conversations, was the Greek crisis, and the inability of State actors to provide a clear way out. The pain of our Greek comrades was palpable, as they struggle with austerity, and its’ draconic results, like 70% youth unemployment. We explored alternatives based in the ideas of decentralization, direct democracy and a moral economy, and examined attempts to actualize these ideas both in Greece and around the world. Our hosts in Patras were associated with a community center, where most of the sessions were held, that they organized in direct response to the crisis, and they spoke movingly about their efforts to strengthen community ties and take meaningful action at the local level to address the problems they faced. Another undercurrent that informed the weekend was the on-going struggle in Rojava. Although a Kurdish delegation that had been scheduled to participate was forced to cancel, we heard an assessment of the current situation from a panel of Turkish comrades, and were inspired by descriptions of a range of European solidarity efforts. While much of the discussion at the conference focused on practical efforts to actualize the ideas of social ecology there was no shortage of theoretical discussion and critique. I participated on a panel with Duncan Rayside offering our critical views on Naomi Klein’s influential book, This Changes Everything: Capitalism vs. the Climate. One of the most interesting presentations was a paper entitled “Neo-Liberal Moralism vis-à-vis a Moral Economy”, skyped in from Melbourne, Australia by Damien Gerber, in which he explored the social psychology of Eric Fromm and its relevance to Bookchin’s ideas. It was a very thoughtful and stimulating analysis. There was a great deal of interest in direct democracy and I gave a talk about the New England Town Meeting, drawing on my experience in the town where I live in Vermont, The panel also examined efforts to implement Libertarian Municipalism in a Spanish village, where social ecologists ran a campaign and won a seat on the village council. Overall I left the weekend feeling encouraged by the energy and commitment of the participants, and more convinced than ever of the importance of the ideas of social ecology and their ability to impact social movements around the world For more information see the TRISE website.